Want A Link On JamieOliver.com? Well, do you? I’ve been sitting on this one for a few weeks and I didn’t want to use it for any of my clients, but I was going to test it on some of my lesser, personal websites. I’ll cut to the chase as I know you are all chomping at the bit. Everyone worth their SEO salt knows about or has tried forum profile linking. Well, this is no different. You create an account on a forum/blog. Whilst filling in details you are often asked for a bio or a link to your website. You put your links in and voila, you have a page with semi relevant content and a nice clean do follow link on a domain you don’t own – and for free!All you need to do now is pour links into that page to increase its authority and you’re rocking and rolling. The downside to this tactic is it normally only works on very low quality, poor websites (custom phpBB installs for example), but every once in a while an absolute cracker comes along where a web developer didn’t nofollow the link. I give to you jamieoliver.com. JamieOliver.com, like many other websites have integrated a social aspect to their website, allowing commenting, sharing of recipes and general interaction with their users. Just as I mentioned above, you can create your own profile, your own bio links and you can get your own link. 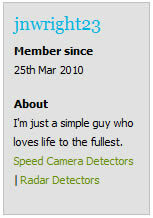 Jamie Oliver - Selling Speed Cameras? Jamie Olivers sister might be interested in snakeoil salesmen? LMAO.Speechless.Such a good tactics but the spam.Ugh!